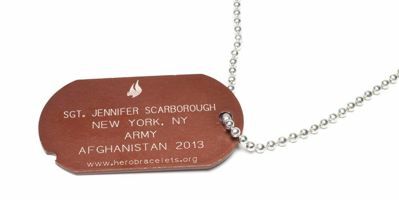 Our Deployed HeroTag is designed in bronze color anodized aluminum to honor those currently serving, and is shipped with a 24" military-style chain. Customize 4 lines of type, up to 25 characters per line. HOW YOU TYPE YOUR INFORMATION HERE IS HOW IT WILL APPEAR ON THE TAG. Please use upper and lower case for the best result. As with all HeroBracelets, a $2 donation to the service organization of your choice will be made for each order.